Small group experience; Max 16, Avg 14. You will be met at the airport and transferred to the hotel to start your adventure. Enjoy a spread of grilled meats, vegetables and homemade salads, and talk with your friendly hosts about life in South Africa. Take a self guided tour around the complex and learn about the history of the apartheid in South Africa. Take a guided tour of bustling Soweto and learn more about its important history. The residential area was created under apartheid and played a significant role in bringing the issues of segregation to the forefront. The anti-apartheid movement was launched here by its most famous resident, Nelson Mandela. Explore South Africa’s largest township on two wheels and under your own steam. This guided tour will take you through the vibrant streets of Soweto, giving you the opportunity to meet some of its diverse residents, see the sights, hear the music and even taste a local ‘home-brewed’ beer. Popular stops include the Hector Pieterson Memorial and Vilakazi Street, where Nelson Mandela used to live. Enjoy a full day scenic drive along the famed Panorama Route with stops at Blyde River Canyon, Bourke's Luck Potholes, and God's Window. Continue to our tented camp located near the Kruger National Park and this evening enjoy a delicious South African dinner in the boma. Enjoy a scenic drive along the famed Panorama Route. You’ll see magnificent mountains, panoramic passes, valleys, and waterfalls. 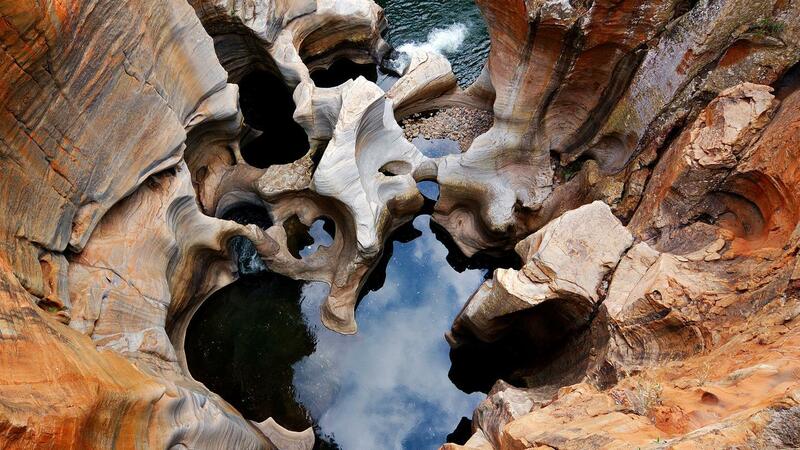 There will also be stops at Blyde River Canyon, Bourke's Luck Potholes, and God's Window. Get a better view and take better snapshots aboard this off-road ride. Hop in a 4x4 safari vehicle and get yourself one step closer to the surrounding nature. 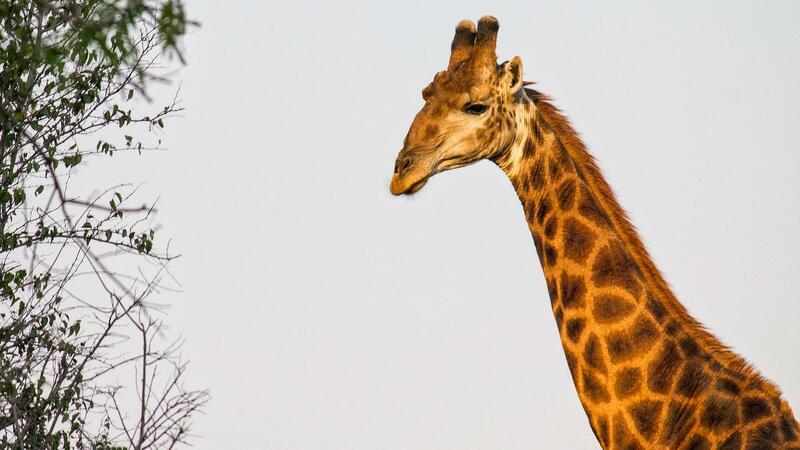 Be ready to spot elephants, giraffes, hippos, lions, zebras, and many other species in this impressive South African NP. Opt to take an optional afternoon safari drive or nature walk. Head out on a guided walk to explore the extensive estate of the Muluwa Lodge. Enjoy the diverse scenery of the Lowveld, and keep an eye out for the 'plains' wildlife that graze close to the lodge. After an included lunch in the National Park, continue your safari drive in 4x4 safari vehicles. Meet with a researcher from the Endangered Wildlife Trust's Cheetah Metapopulation Project, a project managed by National Geographic grantee Vincent van der Merwe. A member of Vincent's team will give a talk about cheetahs in South Africa and the important research CMP is doing. We will also discuss conservation within parks and reserves in South Africa and National Geographic's Big Cats Initiative. You will then be accompanied by the researcher on a wildlife safari drive to give you more insight into cheetahs and other carnivores. Enjoy early morning and afternoon safari drives with our local guides, searching for buffaloes, elephants, leopards, lions, and rhinos – Africa's famed Big Five. In our down time, relax at the camp, take a walk around the grounds, or enjoy a cool drink on the deck. Wake up before the sun (around 5am) and sip your morning coffee before heading out on a morning wildlife safari drive. Return to the lodge for brunch and some leisure time. Converse on the deck, walk the grounds and gardens, and enjoy high tea. Following tea, it's time for a late afternoon safari drive. After spotting tons of wildlife, it’s time to return to camp and freshen up before dinner. Jump into a safari 4x4 and keep your eyes open for fantastic wildlife encounters. Wildlife safari drives are conducted with qualified wildlife rangers and Shangaan trackers; both will share their vast experience of the African bush. Relax and enjoy some down time between wildlife safari drives. Flatter Ncube is the head of her family which includes two sisters and numerous children. She’s the youngest of a family of 10 and, now in her early 40s, lives in the village she was raised in near Victoria Falls. There she takes care of her extended family on their homestead, which she and they have been proudly building by hand, brick by brick, for years. Flatter’s story highlights that life isn’t easy in Africa, but despite its challenges, there is much love and laughter and a strong sense of family here. Visit Flatter’s homestead in her rural village; meet her and some of her family, and walk with some of them throughout the property, among the fruit and vegetable plants the family grows for consumption. (They even plant hot chillies among the vegetables to discourage nosy elephants.) Then help the family prepare a traditional Zimbabwean dinner, which we'll all eat together outside on the property, weather permitting. Ingredients for the meal will have been hand-selected earlier in the day, at the bustling and friendly local village market. This experience offers great insight into typical African life, and ultimately reinforce how we all really want and need the same things in life: a stable home full of love, a good education, and plenty of opportunity for our children. Join a knowledgeable guide for an unforgettable experience at Victoria Falls. Explore the rainforest and learn about the geology, history, and local legends of this world wonder. After your immersion, get up close to the falls and discover the beauty of “the smoke that thunders.” Be sure to have your camera ready! Take the opportunity to go whitewater rafting on the Zambezi River while Victoria Falls roars above. Depart in the morning and navigate through the canyon that forms the famous falls. The dramatic rapids will fill you with excitement and complete your experience. Includes a full-day of rafting on class III-V rapids, transfers, and lunch. Please note: River conditions and activity pricing vary depending on the seasons. High water season is from about February to July. Low water season generally runs from August to January each year - this is when the Zambezi is at its very wildest. The "closed season" is dependent on the season’s rains, and usually is from March to April; during this time rafting on the river is not permitted. Additionally, this activity requires passengers to hike down and up the Batoka Gorge (approx. 45 minutes each way) to access the river; an average level of fitness is required. This activity price excludes a $10 park entrance fee. Climb aboard and cruise along the beautiful Zambezi River. Enjoy some snacks, drinks, a festive atmosphere, and gorgeous views of the sunset. It's the ideal way to end an eventful day in Victoria Falls. Get the adrenaline pumping with a bungee jump from the Victoria Falls Bridge over the Zambezi River. Hear the rush of Victoria Falls as you enjoy this once in a lifetime experience. You don't want to miss the opportunity to see Victoria Falls from above. Watch the Zambezi River make its way toward the gorge and form the largest waterfall in the world. During your 15-minute ride, you will have time to take in the incredible views over the falls, Livingstone Island, and Mosi-oa-Tunya National Park while snapping as many pictures as you like. You may be lucky enough to see some giraffes and elephants in the surrounding landscape and even catch a rainbow over the falls. Includes pick-up and drop-off from hotel and a 12-15min flight. Please note there is a cost for an additional park fee paid for on-site at time of the activity. 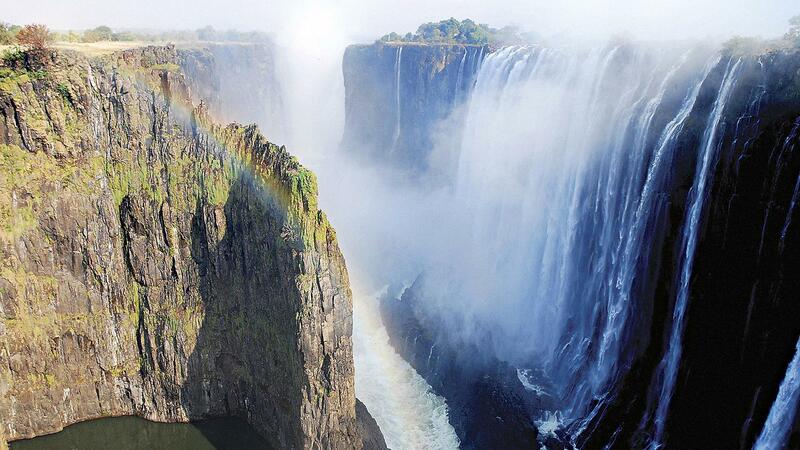 You don't want to miss the opportunity to see Victoria Falls from above. Watch the Zambezi River make its way toward the gorge and form the largest waterfall in the world. During your 25 minute ride, you will have time to take in the incredible views over the falls, Livingstone Island, and Mosi-oa-Tunya National Park while snapping as many pictures as you like. This extended ride also includes time flying over the vast and towering walls of the Batoka Gorge. You may be lucky enough to see some giraffes and elephants in the surrounding landscape and even catch a rainbow over the falls. Includes pick-up and drop-off from hotel and a 25min flight. Opt to canoe above the Falls on the upper Zambezi for a unique and tranquil bird and animal sighting experience. Not ready to leave? Your CEO can help with any onward travel arrangements you require. Take a 12-15 Microlight flight over the falls to get an unparalleled, unobstructed view of the spectacular gorge that the Zambezi River has carved into the surrounding landscape over thousands of years. Please note that this activity takes place in Livingstone, Zambia and visa fees are not included in the price of this activity. Jump on a boat and cruise on the beautiful Zambezi River. Enjoy some snacks, drinks, a festive atmosphere, and, of course, gorgeous views of the sunset. 8 breakfasts, 2 lunches, 7 dinners. Allow USD140-185 for meals not included. Chief Experience Officer (CEO) & driver for Kruger portion, local CEO in Victoria Falls, local guides/rangers. You don't want to miss the opportunity to see Victoria Falls from above. Watch the Zambezi River make its way toward the gorge and form the largest waterfall in the world. During your 15-minute ride, you will have time to take in the incredible views over the falls, Livingstone Island, and Mosi-oa-Tunya National Park while snapping as many pictures as you like. You may be lucky enough to see some giraffes and elephants in the surrounding landscape and even catch a rainbow over the falls. Includes pick-up and drop-off from hotel and a 12-15min flight. Please note there is a cost for an additional park fee paid for on-site at time of the activity. 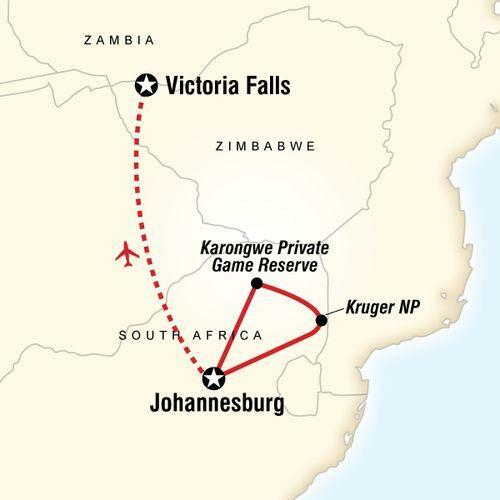 You don't want to miss the opportunity to see Victoria Falls from above. Watch the Zambezi River make its way toward the gorge and form the largest waterfall in the world. During your 25 minute ride, you will have time to take in the incredible views over the falls, Livingstone Island, and Mosi-oa-Tunya National Park while snapping as many pictures as you like. This extended ride also includes time flying over the vast and towering walls of the Batoka Gorge. You may be lucky enough to see some giraffes and elephants in the surrounding landscape and even catch a rainbow over the falls. Includes pick-up and drop-off from hotel and a 25min flight. Please note there is a cost for an additional park fee paid for on-site at time of the activity. Take the opportunity to go whitewater rafting on the Zambezi River while Victoria Falls roars above. Depart in the morning and navigate through the canyon that forms the famous falls. The dramatic rapids will fill you with excitement and complete your experience. Includes a full-day of rafting on class III-V rapids, transfers, and lunch. Please note: River conditions and activity pricing vary depending on the seasons. High water season is from about February to July. Low water season generally runs from August to January each year - this is when the Zambezi is at its very wildest. The "closed season" is dependent on the season’s rains, and usually is from March to April; during this time rafting on the river is not permitted. Additionally, this activity requires passengers to hike down and up the Batoka Gorge (approx. 45 minutes each way) to access the river; an average level of fitness is required. This activity price excludes a $10 park entrance fee. 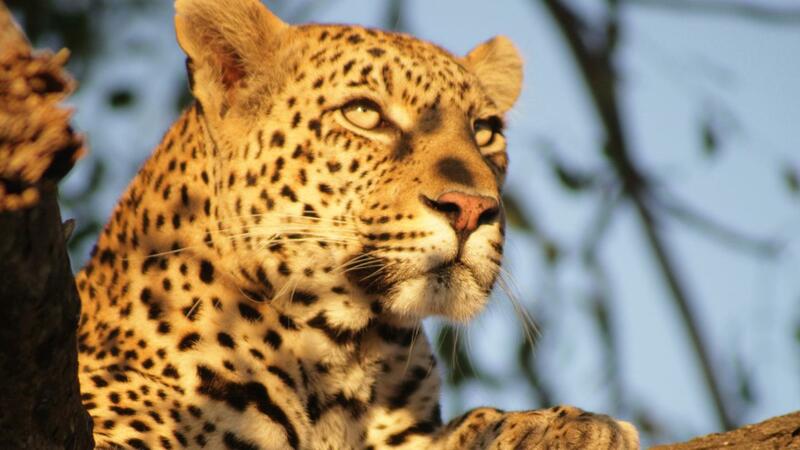 National Geographic Journeys Exclusives: Carnivore Conservation Experience, Karongwe Private Game Reserve. National Geographic Journeys Exclusives: Zimbabwean Family Dinner, Victoria Falls. Arrival transfer. Traditional South African braai (BBQ). Panorama Route scenic drive. Kruger National Park and private nature reserve wildlife safari drives in open vehicles. Tour of Victoria Falls. Internal flights. All transport between destinations and to/from included activities. Ride through Kruger National Park in an open safari vehicle, Meet researchers from the Endangered Wildlife Trust's Carnivore Conservation Programme, Visit the awe-inspiring Victoria Falls. 2) Most lodges and camps do not have 24hr electricity - they usually run on generators which are routinely shut off overnight from approximately 10pm to 5am. African Union / Unity Laissez Passes, Andorra, Argentina, Australia, Austria, Belgium, Botswana, Brazil, Canada, Chile, Czech Republic, Denmark, Ecuador, Finland, Japan, Liechtenstein, Luxemburg, Malta, Monaco, Netherlands, Norway, Paraguay, Portugal, San Marino, Singapore, Spain, St Vincent & the Grenadines, Sweden, Switzerland, United Kingdom, Uruguay, Venezuela, United States of America, France, Germany, Greece, Iceland, Israel, Italy, Jamaica. Antigua and Barbuda, Barbados, Belize, Benin, Bolivia, Hong Kong, Hungary, Jordan, Lesotho, Malaysia Cape Verde, Costa Rica, Cyprus, Gabon, Guyana, Peru, Poland, Seychelles, Slovak Republic, South Korea, Swaziland, Thailand, Turkey, Zambia. **Please note for those traveling with minors: Effective June 01, 2015, anyone under the age of 18 will not be allowed entry without an unabridged birth certificate. If they are not traveling with both parents or adults who are not the child's parents, further documentation is required. Please check with your South African embassy or consulate for the most current list of document requirements. Antigua & Barbuda, Angola, Aruba, Bahamas, Barbados, Belize, Botswana, Cayman Islands, Congo DRC, Cyprus, Fiji, Ghana, Grenada, Hong Kong, Jamaica, Kenya, Kiribati, Leeward Islands, Lesotho, Madagascar, Malaysia, Malawi, Maldives, Malta, Mauritius, Montserrat, Mozambique, Namibia, Nauru, Samoa Western, Seychelles, Singapore, South Africa, Solomon Islands, St Kitts and Nevis, St Lucia, St Vincent, Swaziland, Tanzania, Trinidad and Tobago, Turk & Caicos Islands, Tuvalu, Uganda, Vanuatu, Zambia. Algeria, Andorra, Argentina, Austria, Australia, Azerbaijan, Belarus, Belgium, Bermuda, Bosnia-Herzegovina, Burundi, Brazil, Brunei, Canada, Cape Verde Islands, China, Comoros Islands, Cook Islands, Croatia, Cuba, Czech Republic, Denmark, Dominic Republic, Egypt, Estonia, Equatorial Guinea, Finland, France, French Polynesia, French West Indies, Gibraltar, Georgia, Germany, Greece, Haiti, Hungary, Indonesia, Iceland, Iran, Ireland, Israel, Italy, Japan, Kazakhstan, Korea (South), Kyrgyzstan, Kuwait, Latvia, Liechtenstein, Lithuania, Luxembourg, Macau, Marshall Island, Micronesia, Moldova, Monaco, Netherlands, New Caledonia, New Zealand, Northern Mariana, Norway, Palau Islands, Palestine, Papua New Guinea, Portugal, Puerto Rico, Russia, Rwanda, Samoa, Sao Tome, Serbia, Slovak, Slovenia, Spain, Suriname, Sweden, Switzerland, Tajikistan, Turkey, Turkmenistan, Ukraine, United Arab Emirates, Uruguay, United Kingdom, United States of America, Uzbekistan, Vatican, Virgin Islands. Afghanistan, Albania, Armenia, Bahrain, Bangladesh, Benin, Bhutan, Bolivia, Bulgaria, Burkina Faso, Cambodia, Cameroon, Central Africa Republic, Chad, Chile, Colombia, Congo Brazzaville, Costa Rica, Conakry, Cote de Voire, Djibouti Republic, Ecuador, El Salvador, Eritrea, Ethiopia, French Guiana, Gabon, Gambia, Guam, Guatemala, Guinea, Guinea Bissau, Guyana, Honduras, India, Iraq, Jordan, Korea (DPRK), Laos, Lebanon, Liberia, Libya, Mali, Mauritania, Mexico, Mongolia, Morocco, Myanmar, Nepal, Nicaragua, Niger, Nigeria, Norfolk Islands, Oman, Pakistan, Panama, Paraguay, Peru, Philippines, Qatar, Reunion, Romania, San Marino, Saudi Arabia, Senegal, Sierra Leone, Sri Lanka, Somalia, Sudan, Syria, Taiwan, Thailand, Togo, Tunisia, Venezuela, Vietnam, Yemen Republic, Yugoslavia. IMPORTANT NOTE: If you have purchased a single entry visa upon arrival and then decide to leave Zimbabwe (even for a few hours) you will need to buy another visa to re-enter Zimbabwe. In this instance you should buy a double entry visa upon arrival as it works out cheaper. Multiple entry visas cannot be obtained at the port of entry into Zimbabwe. You may enter Zimbabwe on a single entry visa and then obtain a multiple entry visa from the town office - but this may take up to 7 working days to be issued. Alternatively, a multiple entry visa can be obtained from the Zimbabwe Embassy in your country prior to departure for Zimbabwe. Tipping is one of the most direct ways that you can have a positive economic impact within the African community. Although it may not be customary for you, it is an important source of income for those in the tourism industry. Giving a tip should be a seen as a formal 'thank you', and the action should in no way be awkward. GENERAL: Look after your personal items. Do not leave your valuables visible in a car or hotel room. Lock your hotel room door when you enter and when you leave. Do not carry large amount of cash on you. Avoid displaying flashy jewellery and carry your camera in its pack on your shoulder rather than around your neck. Keep your passport, airline tickets, money, important documents locked up in your room/safe - do not carry it with you. Eating is a big part of travelling. Travelling with G Adventures you experience the vast array of wonderful food that is available in South Africa. On this tour, we provide only a few meals for you and your group members, so as to give you the maximum flexibility in deciding where, what and with whom to eat. It also gives you more budgeting flexibility in your choices. Our groups tend to eat together to enable you to taste a larger variety of dishes and enjoy each other's company. There is no obligation to do this though - while in the larger centres, your CEO will be able to suggest favourite restaurants during your trip.